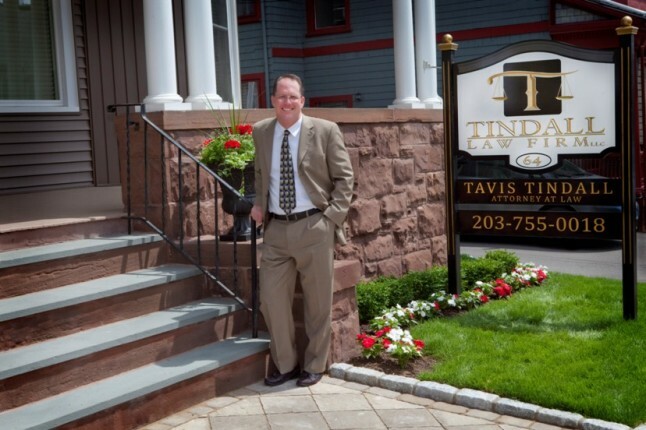 Connecticut litigation attorney Tavis Tindall renovated a 1908 Victorian clubhouse as new offices for his bi-lingual Tindall Law Firm, LLC. Tindall also has offices in Hartford and the practice also specializes in personal injury and workmen's comp. Attorney Tavis Tindall in Front of 64 Holmes Ave Offices in Waterbury, Conn. Specializing in civil litigation, the Tindall Law Firm, LLC represents clients in the areas of personal injury and workmen’s compensation cases. The firm also helps clients in the areas of real estate transactions, family law, wills and trusts, and criminal law. Tavis Tindall, and his bi-lingual Spanish-speaking paralegal staff of three, includes paralegal and office manager for ten years, Ms. Omayra Pizarro; paralegal Maria Morales-Grant who has been with the firm since December 2008; and Ms. Tawnisha Nieves, paralegal with the firm since August of 2011. Kelly Tindall, Attorney Tindall’s wife, also assists the firm with office-related work and was instrumental in creating the historically-enhancing décor for the building renovation. Tavis Tindall gave much credit to the exceptional talents of his wife, Kelly, and the lightning speed renovation expertise of Tom Pellicano, owner of Grandview Homes in Southbury, and his staff. Attorney Tindall stated, “The combination of Kelly’s instinctive decorating sense and Grandview Home’s extensive building and renovation experience, enabled us to renovate this building and occupy it within one month of purchase. Grandview Homes worked immediately after we closed on December 3 until we moved in on December 27. They began by putting a new roof on the 104-year-old building. They then replaced the front porch pillars and the wrap-around front porch. Nick Dauti of N&D Masonry then expertly restored the front walkway and steps in elegant fashion. While Grandview Homes renovated the exterior, they were also restoring the building’s grand entrance foyer, and the first two floor’s walls and ceilings. Once completed, they painted all nine rooms and offices, the kitchen, bathrooms and hallways. Real estate broker Colleen Platt of the Washington Agency in Torrington was responsible for negotiating the sale, and Tindall also gave her high accolades for her skill and attentivefollow through in securing the purchase. He also spoke appreciatively of the professional landscaping services provided by Stephen M. Somosky, Jr., president and owner of Landscape Solutions of Connecticut, LLC of Glastonbury, Connecticut, who helped transform the outside entrance to the building. Attorney Tindall also praised family members who have played an instrumental role in helping with the move and with many tasks that were an essential part of the move and renovation, most notably the hard work of his father-in-law Robert Hughson. On June 14, the staff of the Tindall Law Firm LLC will welcome guests to a celebration of their practice’s new location at 64 Holmes Avenue in Waterbury. Invited guests will enjoy wine and hors d’oeuvres prepared and served by La Tavola Ristorante based at 702 Highland Avenue in Waterbury. For more information on the Tindall Law Firm, LLC and attorney Tavis O.Tindall, visit www.tindall-lawfirm.com or call 203-755-0018, or toll free call 866-488-8625.